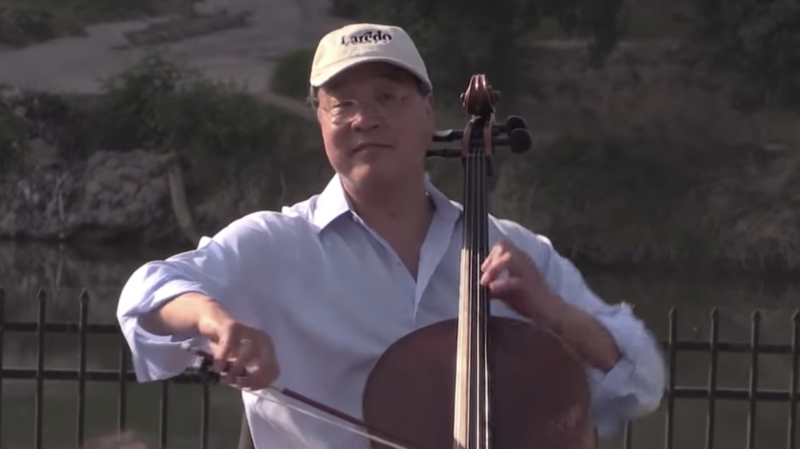 World-class cellist Yo-Yo Ma played part of Johann Sebastian Bach's cello suites on Saturday at the U.S.-Mexico border to use culture and the arts as a way to "build bridges, not walls" between the two countries. ...he told the audience, "A country is not a hotel and it’s not ‘full." That was a direct rebuke to Trump's recent claim that the country is full and we can't take any more. "As you all know, as you did and do and will do, in culture, we build bridges, not walls," he told the audience. At the end of his performance, he pointed to the international bridge. "I've lived my life at the borders. Between cultures. Between disciplines. Between musics. Between generations." Ma's performance was part of his Bach Project launched in 2018. He plans to perform Bach's six suites for solo cello in 36 locations around the world, as a means to connect cultures and humanity from all walks of life and parts of the world. Watch his performance above, via NPR. Trump says the Democrats are ‘anti-Jewish.’ The numbers don’t bear that out.